Back in Windham’s early days, when carriages and buggies were the primary means of transportation, there were a number of taverns scattered throughout our town. One of the most popular in the crossroads area of Windham Hill at the corner of Ward and Windham Center roads. It has gone through several different nomenclatures, but is best known as Webb Tavern. Major Edward Anderson began construction of the building in the early 1800s. It was meant to be his private residence, but he died in 1804 before it was completed. By 1857, it had become a tavern owned by George W. Davis and named Windham House. During this time, Windham Center Road was a major thoroughfare between the White Mountains of New Hampshire and the port of Portland. The tavern was a popular stop for coaches carrying passengers and teamsters taking goods to market. Local legend has it that during Civil War, the tavern was a stop on the Underground Railroad. Dr. Charles Parsons, a Windham Hill resident, was a teacher at the Abyssinian Meeting House in Portland, a northern hub of the railroad. Some believe he hid runaway slaves at his residence and took them to the tavern to be transported up north to Canada. In the 1870s, Jason Webb assumed ownership of the business and changed the name to Webb Tavern. He had the reputation of being a genial proprietor and his popularity helped him win election as a state representative. According to a story in the Oct. 7, 1986, edition of the Courier Free Press, a vice consul from England summered at the tavern one year during World War I. Townspeople enjoyed watching his black limousine drive by as he made his daily trip into Portland to conduct business. For a short while during the 1900s, the building took on an unusual purpose. It was purchased by Charles Smith to house people suffering from mental illness. were installed on the basement windows during this time. later. The resulting lavish landscape made this a favorite place for many Windham locals. would have seen in the days when it was a tavern. Back then, there were three stories facing out on Windham Center Road. Some believe there was a fire on the third floor at some point, resulting in the design we see today. The four gables on the second floor and the large front porch could have been part of this renovation. Haley Pal is a Windham resident and active member of the Windham Historical Society. She can be reached at haleypal@aol.com. through several different nomenclatures, but it is best known as Webb Tavern. coaches carrying passengers and teamsters taking goods to market. the tavern to be transported up north to Canada. proprietor and his popularity helped him win election as a state representative. year during World War I, a Vice Consul from England summered at the tavern. trip into Portland to conduct his business. was purchased by Charles Smith to house people suffering from mental illness. front porch could have been part of this renovation. 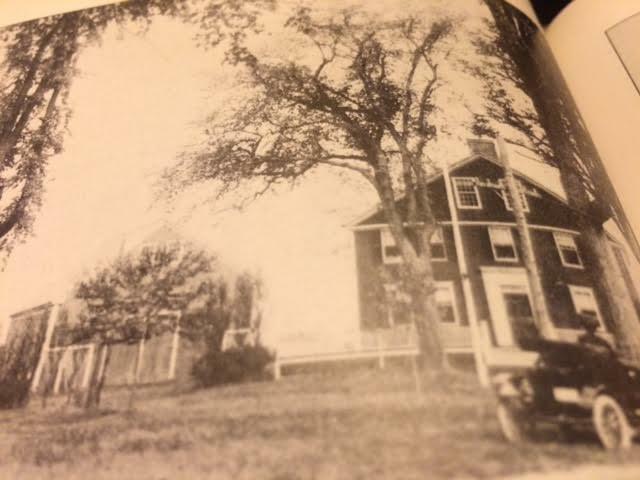 An early photo of Webb Tavern.